Star Wars Adventures #7 opens with a nice Star Wars Rebels tale. 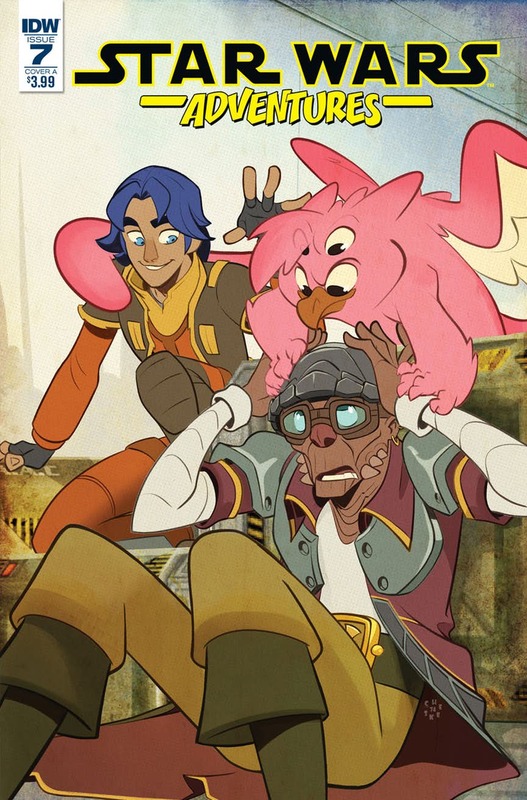 “Endangered, Part 1” has the Rebels crew on a mission to save and endangered bird, only to wind up in an Imperial crossfire and face to face with good old Hondo. Sholly Fisch does a great job of not only nailing the dialog for each character, but capturing the vibe of the show. This story felt like something that could have been an episode in the TV show. And with Star Wars Rebels being over with, it’s good timing for those still looking for a Star Wars Rebels fix. I’ll be honest, I’d probably go on reading an entire series like this. It’s pretty good. Covering the artwork for the Rebels story is Sean Galloway, Cassey Kuo and Luis Antonio Delgado. There was one panel that looked oddly blurry, but other than that, the artwork was really good. The colors are nice and vibrant. There’s good lighting effects to help the artwork pop. Plus the style of the characters works well. It’s a little different than their look on the show, but it’s a consistent look in the story. Afterwards is another Tales From Wild Space tale, this one is called “Look Before You Leap.” It stars Nien Nunb and Shriv. While I haven’t played Star Wars Battlefront II, I have heard Shriv is a cool character in the campaign mode of the game. It’s a fun little story that hearkens back to The Empire Strikes Back and the worm in the asteroid. Couple with some good artwork, it makes for a nice read. Overall, this is a pretty solid issue with two good stories. I give it a five out of five nexus.